Backstage at IMITATION by Tara Subkoff, we spoke to CND nail artist Kristina Estabrooks about the story behind the "blown glass" nails and how to create them at home. This cool, marbelized look adds extra oomph to the natural manicure. To recreate it at home, start by painting your nails with CND Copper Pearl Effect. 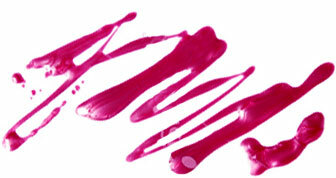 While the nail polish is still wet, randomly place drops of CND Colour in Putty. Finally, create swirls using a wooden manicure stick. Top it all off with a layer of top coat and you've got nails straight from the runway! Trust us, the photos don't do these nails justice!